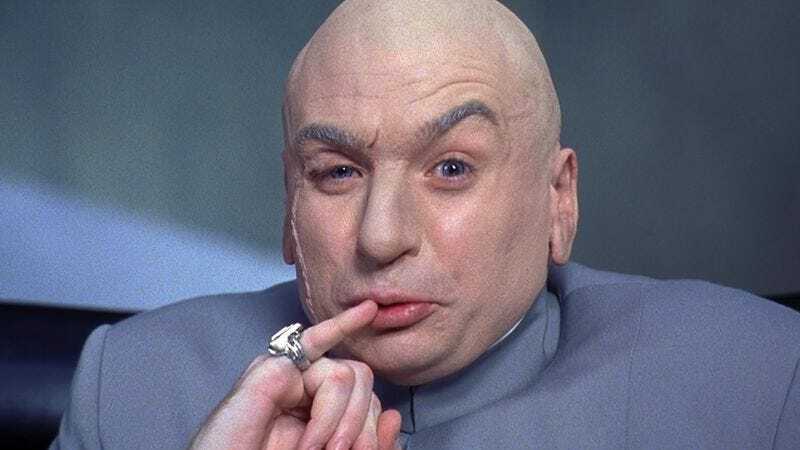 Donald Trump has one simple request: sharks with frickin’ laser beams attached to their heads. Lemonade Stand—the same Los Angeles-based comedy group that gave a voice to the misunderstood pureblooded witches and wizards of Slytherin—has put together a mashup of Donald Trump’s debate performance with classic Dr. Evil quotes. The results are surprisingly fluid, with Dr. Evil’s words fitting rather nicely in Trump’s blabbering mouth. And Dr. Donald Evil Trump has no time for Megyn Kelly and her lady questions. Now we’re just waiting for someone on the internet to create the quiz Who Said It: Donald Trump or Dr. Evil? Hijacking some nuclear weapons and holding the world hostage was a Dr. Evil plan, but building a hundreds-of-billions-dollar wall around the U.S. southern border and having Mexico pick up the entire bill is all from Trump’s brain. Oh, behave.